His copyright litigation experience includes defending IBM and the open source developer community in the landmark SCO v. IBM case involving the Linux mainframe computer operating system. Mr. Chiu also has experience in preparing pre-suit investigations, infringement and non-infringement opinions, and intellectual property due diligence. 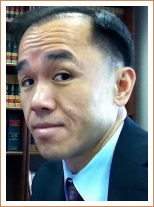 Mr. Chiu was an associate at two of the nation’s leading litigation firms, Cravath Swaine & Moore LLP, and Kaye Scholer LLP, and a trial attorney with "The Legal Aid Society". Prior to becoming a lawyer, Mr. Chiu was an assistant researcher at the Mt. Sinai School of Medicine in New York, where he conducted research in molecular endocrinology.